Why Mass is Different at Different Churches — My Catholic Life! Q. Why do different Catholic Churches do Mass different ways? A. There are a couple of different ways to look at this question. First, there is the Roman Catholic Rite, but there are several other “Rites” such as the Byzantine Catholic Rite, Armenian Catholic Rite, and Syro-Malabar Rite, just to name a few. All of these Rites are in union with the Pope, but the way they celebrate Mass is different, because these Rites evolved differently over the centuries influenced by language and culture. These Rites, while different, also show how the Church is Catholic, since in Greek the word “catholic” means universal. A second way to look at this question is to focus on why one Roman Catholic parish celebrates Mass one way but another Roman Catholic parish down the street celebrates it another way. This can be frustrating for Catholics who are trying to understand the Mass. If one would look at the Missal, the book the priest has on the altar, one would see writing in both red and black. The red words are the instructions or rubrics (coming from the Latin word, rubrus—like ruby) for what we should do in Mass. The black writing is what the priest should say. 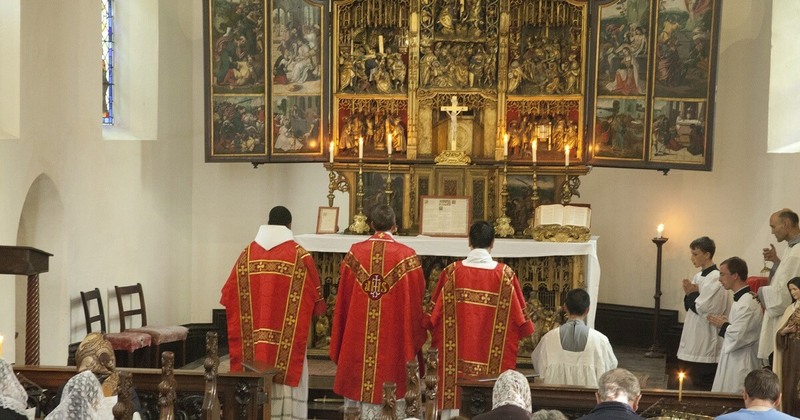 These two parts, the black and the red, are meant to bring uniformity to the Mass. Sadly, some parishes choose to ignore or treat the exact words and the rubrics more like suggestions. When this happens, confusion on exactly what is happening at Mass can set in. The Missal is not meant to restrict prayer but rather guide the people of God in celebrating the most important thing in one’s life, the sacrifice of Christ. Catholics should be able to go to different parishes and feel right at home when it comes to worship.